Digimon: System Restore: Xros Wars Episode 77: Now Revealed! The Secret of the Digimon Hunt! Xros Wars Episode 77: Now Revealed! The Secret of the Digimon Hunt! In this episode, Tagiru is in a prime position to get some real answers from the two people who know the most about DigiQuartz, but passes because they aren't terrorizing the city on this particular instance. As our attention swiftly turns to more characters from other seasons appearing, it's a little off-putting to have to go without them for an episode. We got a glimpse last time and we have the big shiny explosion next time, so what do we have to look forward to here? This is essentially part one of a three-part finale, setting up the conflict to come and starting to dive into some answers. While it fails horribly in doing the latter, it's the one opportunity for the season to shine on its own merits. Without Taichi and company around to steal our attention, this is Hunters taking its characters and core concepts and pushing them all into the pot in one final attempt to make it all look worthwhile. There's enough in here to make you want it to succeed. It's hard to remember that before all the filler ruined everything, the series had some very interesting stuff going on. 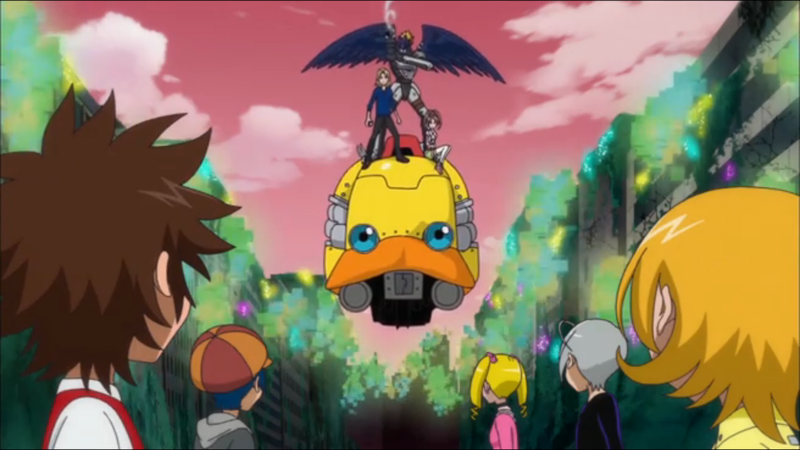 We had this alternate timestream where Digimon could impact the present from the safety of a decaying future. We had hunters that used ethically dubious means of stopping these Digimon. We had this watchmaker who moderated the hunt while clearly having secrets and hidden motives. Before the excitement of the final battle takes over, this is our chance to finally appreciate it all again. Spurring this on is an effort at adding some depth to Tagiru and Ryouma. It's a small, obvious gesture, but seeing Tagiru worrying about his parents is huge. We don't see much, but there's a sense that Tagiru's parents have trouble keeping up with their son, suggesting a disconnect that could go far in providing a dark justification to why Tagiru needs to throw himself so passionately into things. Without an extreme devotion to his hobbies and the friends that can come out of that, you sense that he'd have a pretty lonely existence with both family and peers turned off by his constant energy. The backstory for Ryouma is more thorough, and his eyewitness account of the previous battles explain a couple things about him, particularly his deeper knowledge of Digimon and his admiration for Taiki. But while we have to take his “newfound” respect and cooperation with Tagiru as important, the previous episodes don't serve it well. It assumes a level of antagonism that just never existed on a consistent basis. While he's guilty of associating with Ren and Airu, on his own he's been more helpful and supportive of Tagiru than a true rival. It ends up making the moment less of a dramatic turning point and more of a simple statement. This friendship with Ryouma should give Tagiru a chance to get more information out of him. Ryouma seems to know a lot about DigiQuartz and is very keen on gathering information through any means necessary. If Tagiru's not interesting in learning what Ryouma knows, he needs to understand that Taiki and Yuu would be. Even worse is that he and Hideaki finally corner the watchmaker and start peppering him with questions that really need answering. They end up releasing him just because he isn't responsible for DigiQuartz taking over. 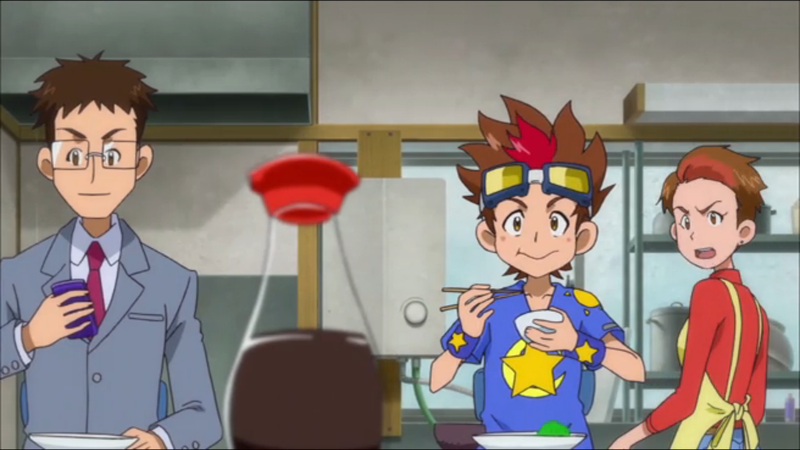 Even if he wasn't, they should still be grilling him on his motives behind establishing hunters and his connection to Taichi and Masaru. Hunters is finally getting serious, and the plot advancement is a welcome sign. The episode tries to rev up the engine again, but it's still stalling. Getting all the kids together to work out a plan looks interesting, but there are so few in the room who can actually help. Seeing Akari and Zenjirou again is nice, but they're about as useful here as Kaneda, Hiroya and the other kids whose names aren't worth looking up. The battle against Infermon ends up being the main six once again, and disappointing when Tagiru suggests an obvious strategy that anyone else should have thought up already. While it's nice seeing Kiriha, Nene and Shoutmon X7, in the end, it just means that once again the main characters of Hunters have to be saved by run-ins from other seasons. This was their one chance to avoid that. In a season where level means so little, it's nice that each of the five incarnations from Tsumemon to Diaboromon are progressively harder to beat. Each level requires more and more firepower from Tagiru and company, a detail which could have easily been overlooked. You know who would have been really nice to have among the people who weren't converted? Mami and her two friends. Their DigimonLand experience should have qualified them and they were a far more regular presence than all those one-shot kids. I'd be interested to hear their perspective on what's happening. We all get that it's meant to set up what happens later, but Ryouma's assertion that somebody betrayed key information to Quartzmon is a stretch. He should have no clue what Quartzmon does or doesn't know on his own, and for him to accuse somebody of feeding him secrets should have made everyone suspicious of him. Instead, most of the fingers are pointed at Ren and Airu, neither of whom seem all that invested in what's going on, but don't seem like the world ending type. It's almost completely overlooked that Tagiru and Ryouma did a successful doublexros. While the net result gets the usual XrosUpArresterdramon monicker all of his digixrosses get, it's no different than Taiki and Kiriha making Shoutmon DX. How disappointing that clockmaker scene becomes in hindsight. The next two episodes contain exposition dumps delivered by him, so it's baffling that they keep him mum for this one and instead just go with a half-hearted tickle torture scene. The pacing over these finale episodes is just off. The season trades on obvious nostalgia with the other seasons' kids later, but it's interesting to note that it also trades on nostalgia for past villains too. Diaboromon and his other forms come from the second movie, Myotismon and all his incarnations from the two Adventure seasons, etc. Even Quartzmon is basically a mixture of Apocalymon (world-destroying large machine with a smaller organic component), D-Reaper (agents, extreme cruelty), and Diaboromon on the internet (ticking time bomb, kid has to enter a spherical zone and destroy the core being to win). It's really quite amusing in its shamelessness. 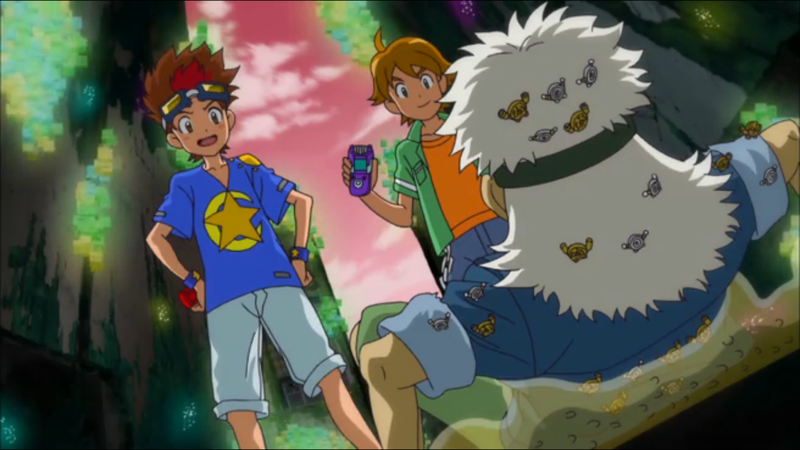 Also, is it a plothole that Gumdramon never noticed anything odd about Astamon after merging with him? Given that Astamon is basically a husk and a puppet by this point, shouldn't Arresterdramon have noticed what he was sharing a body with? I agree: Mami got robbed here. She would have made things more interesting among the "Hunters"-exclusive characters.